Alfred Charles Lovell was born in 1881 at Alton St Pancras, near Dorchester, Dorset and baptised there on 3 April 1881. He was one of the nine children of shepherd Charles Lovell (1856-1940) and Maria née Dunning (1856-1936). Charles and Maria's children were; Emily Jane (b1878), Alfred, James George (b1883), Beatrice A (1884-1976), Mabel Rose (1887-1937), Reginald Sidney (1889-1968), Bertie Everett (1890-1978), Caroline Maria (1895-1965) and Alice Eva (1897-1983). In the 1891 census the family were living at Canford, Dorset, where Charles worked as an agricultural labourer. Towards the end of 1899, or perhaps January 1900, Alfred enlisted in the 1st Battalion, Dorsetshire Regiment. His Service Number was 6076. The 1st Battalion had just taken part in operations in the Tirah Campaign on the North West Frontier of British India during 1897–98. Alfred would soon join his Regiment in India, where he was to spend the next twelve years. On 26 January 1907, at Madras, India, 26-year old Alfred married Mary Edith Russell. On returning to England they set up home at 15 Wellington Street. The 1911 census recorded Alfred in India again. The 1st Battalion was in Belfast when war broke out: it landed at Le Havre in August 1914 forming part of the 15th Brigade in the 5th Division. It transferred to 95th Brigade in the 32nd Division in December 1915 and to the 14th Brigade in the same Division in January 1916. At some point in time Alfred transferred to the 5th (Service) Battalion, Dorsetshire Regiment and Alfred was in the Battalion when it took part in the Gallipoli Campaign. The Gallipoli Campaign, also known as the Dardanelles Campaign, was a campaign that took place on the Gallipoli peninsula in the Ottoman Empire between 25 April 1915 and 9 January 1916. 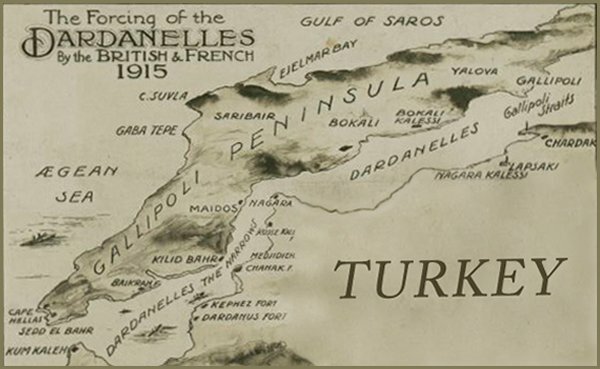 The peninsula forms the northern bank of the Dardanelles, a strait that provides a sea route to what was then the Russian Empire. Intending to secure it, Russia's allies Britain and France launched a naval attack followed by an amphibious landing on the peninsula with the eventual aim of capturing the Ottoman capital of Constantinople (modern-day Istanbul). The naval attack was repelled. On 11 July 1915 the 5th Battalion landed at Suvla Bay on the Gallipoli peninsular. In the next six months they lost relatively lightly in battle but heavily from the sickness that was the scourge of soldiers in this abortive campaign. After eight months' fighting, with many casualties on both sides, the land campaign also failed. and the invasion force were evacuated from there in December 1915. The Gallipoli Campaign was one of the greatest Ottoman victories during the war and a major Allied failure. Evacuated in January 1916, the 5th Battalion redeployed to Egypt, where they remained for six months digging defences against an expected Turkish offensive which never came. May 1917 saw the 5th Dorsets in action at Messines. On 1 May 1917 Alfred was killed in the trenches during a bombardment, the circumstances were reported in the 18 May edition of the Western Gazette "Mrs Lovell, of 15 Wellington Street, Yeovil, has received the sad intelligence that her husband Private Lovell of the Dorset Regiment was killed in action in France on May 1st. Writing to the deceased’s wife, Colonel CC Hannay states:- “It is with the greatest regret that I have to inform you that your husband Priv. Lovell, was killed last night (May 1st) by the explosion of a shell. It is a great loss to me, for he had been my servant so long, and he was always so cheery, and hard working. He had just left Battalion Headquarters, about 9.45 p.m. last night when a shell burst in the mess cookhouse killing our mess waiter, and severely wounding your husband and another man. Private Lovell was hit in the face, but was quite conscious and cheerful. He died as he was being taken to the dressing station. I offer you my sincerest sympathy in your great loss.” Another letter received from Mrs. Hannay says:-“We all liked Lovell so much, and it seems so extra hard after being abroad so long, that he should be taken now.” Private Lovell, who belonged to the Regular Army, had served seventeen years, twelve of which were spent in India. He had seen active service at the Dardenelles, and was transferred to France with his Regiment (the Dorsets) where he had remained until the time of his death. During his stay in France he had seen considerable fighting, and up to the time of his death had come through the fighting unscathed. The deceased soldier was 36 years of age. Much sympathy is felt for his wife and family in their sad bereavement." 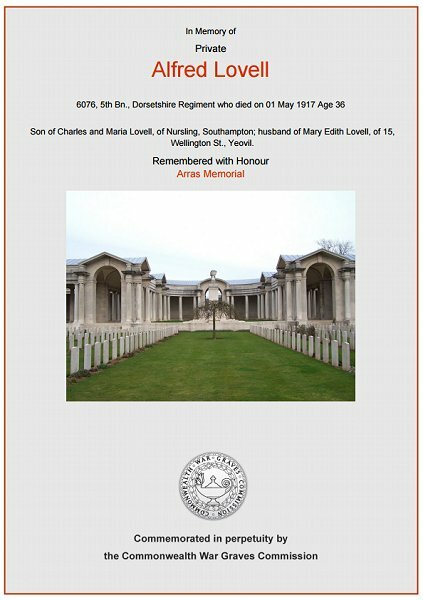 Alfred Lovell is commemorated on Bay 6 of the Arras Memorial and his name is recorded on the War Memorial in the Borough. Alfred's baptism entry in the parish register of Alton St Pancras, Dorset. The Commonwealth War Graves Commission certificate in memory of Alfred Lovell.